Your USB drive or USB port not working on Windows 10/8/7/XP? Your USB drive, pen drive, SD card, or external hard drive is malfunctioned or not showing up due to USB port not working? This guide provides multiple effective solutions which should help you solve the problem quickly and safely. Just start from the first solution and work your way down and the USB not working issue will be removed. Why are my USB ports / device not working? How to recover data from USB drive which is not working in Windows 10? "Good evening guys. I'm troubled by an issue with my USB which is not working as before. The issue started after I shut down my laptop, as I wanted to insert a memory card which is used on my cellphone. After the memory card was connected via a card reader, I pressed the power button to start Windows. But this time, the USB device does not work as usual. I tried the device on a different USB port, but still got same result. I checked Device Manager and saw a yellow '!' there. I'm not sure what else I can do to fix it, as I cannot afford losing photos on the memory card! Any ideas? Thank you in advance!" USB drive is one the of most popular storage devices preferred by users who would like to store files on it or share data on different machines. These USB devices provide greater convenience than floppy disk, as they are very portable and offer very large capacity. However, USB drives or USB port may not work properly and bring poor user experience. For example, when you insert USB device to computer, USB is not recognized or showing up in Windows. In other cases, the USB drive shows up in Windows, but it does not work as expected, such as it cannot be accessed as usually. Most often, USB devices carry important data for users, and users may risk losing all files if USB stops working. The good news is that it does not necessarily mean the USB is not repairable even though your PC or laptop stops recognizing USB stick or USB port stops working. If the not working USB drive contains important data, you should try retrieving data in the first place, after which you can try following methods to repair it. On account that this problem that computer cannot detect USB device happens randomly, it is not easy to make sure the exact cause on a certain case. Hardware vendors of USB device and IT professionals have investigated the issue, but the results are quite inconclusive due to the intermittent nature of the problem. Thus we just list some of the most common causes that lead to USB not working error for your reference. Power supply issue: there is something wrong with the power supply and the USB cannot be recognized. Faulty device: the USB device gets damaged such as bad sectors, components damage. Power management settings: the default settings on your PC is not reasonable. Problematic drivers: the USB drivers on your computer are corrupted or outdated. Damaged USB ports: the USB post on your machine is physically damaged. Now that causes vary from people to people, there shouldn't be only one solution to this issue. In the following content, we'll list a couple of solutions which have been tested and proved workable by many users. Before you carry out any solutions, you should try the old but easiest method first: turn off computer and restart it. Sometimes you can end up with fixing the issue via this easiest solution. Step 1 Remove all USB devices connected to your computer and shut down system. Step 2 Remove battery from your laptop and wait for about 10 minutes. If you are using desktop, unplug the power from the back of computer case. Step 3 Press power button to boot computer. When computer enters system, go ahead and connect your USB device. If restarting computer fixes the problem, you are done with the issue. If you are not that lucky, then go to following methods. If the restarting does not help, you need to check if there is something wrong with the USB port. First, you should take a close look at the USB port and check if there is anything sticking inside. 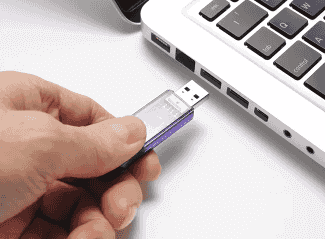 If the USB port is filled with stuff, you need to shut down computer and gently clean the USB port with something thin and soft. Next, what you should pay attention to is checking if the USB port is loose. USB port stops working might be caused by a loose or broken connection. You can test this by inserting USB device and gently wiggling the connection. Please be gentle dong this, or you may create an extra hardware problem. Usually, a computer has more than one USB port, so you need to try connecting the USB device to a different one so that you can rule out which USB port is broken. Besides, it is necessary to try plugging USB device to a different computer, which helps to check if the device is damaged. Step 1 Open Device Manager. Windows 10 users can easily open it via right-clicking Start menu and selecting Device Manager. Other users can open it in this way: press Window logo key and R to open Run box where you can type devmgmt.msc and click OK. Step 2 View the Device Manager to locate Universal Serial Bus controllers. Expand it and you can see USB Root Hub items. 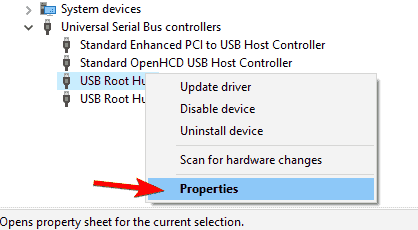 Step 3 Right-click on USB Root Hub and select Properties. Step 4 Click Power Management tab on Properties window, and unselect the option "Allow the computer to turn off this device to save power". Click OK to save changes. Note: there might be more than one USB Root Hub under Universal Serial Bus controllers, and you need to repeat operations above on each of them. If your USB device works and can be recognized by other computers expect yours, it may be caused by corrupt or outdated drivers, so updating drivers for the device may solve the problem. Step 1 Open Device Manager. You can view the first step in Method 3 to launch Device Manager from your computer. Step 2 Locate and expand Universal Serial Bus controllers and you can view USB controllers under this item. 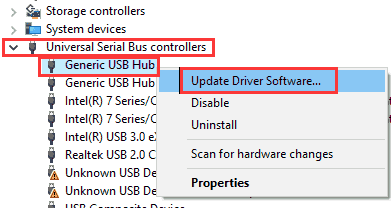 Step 3 Right-click on the first USB controller and select "Update Driver Software" option from the context menu. Step 4 Select "Search automatically for updated driver software" and click Next. Then Windows will search your computer and the Internet for the latest driver software for the device. Step 5 Repeat these actions on all USB controllers once the driver is updated successfully. Then reboot computer and check if the problem is fixed or not. Step 1 Type "power option" in the searching box on taskbar and click Power Options from the searching result. Step 2 Click "Choose what the power button does" from the left pane, and then click "Change setting that are currently unavailable". Step 3 Uncheck the option "Turn on fast startup (recommended)" under Shutdown settings. Then click Save changes. Step 1 Open Setting window and select Update & security option. Step 2 Click Check for updates button on the right pane and Windows will check and download available updates for you. Step 3 Windows will install updated after downloading and you need to restart computer once updates are installed. Once the USB not working issue is fixed, you can now try connecting USB drive to computer and transfer data. If the USB drive is not accessible and reports errors like "The file or directory is corrupted and unreadable" and you cannot access data on it. 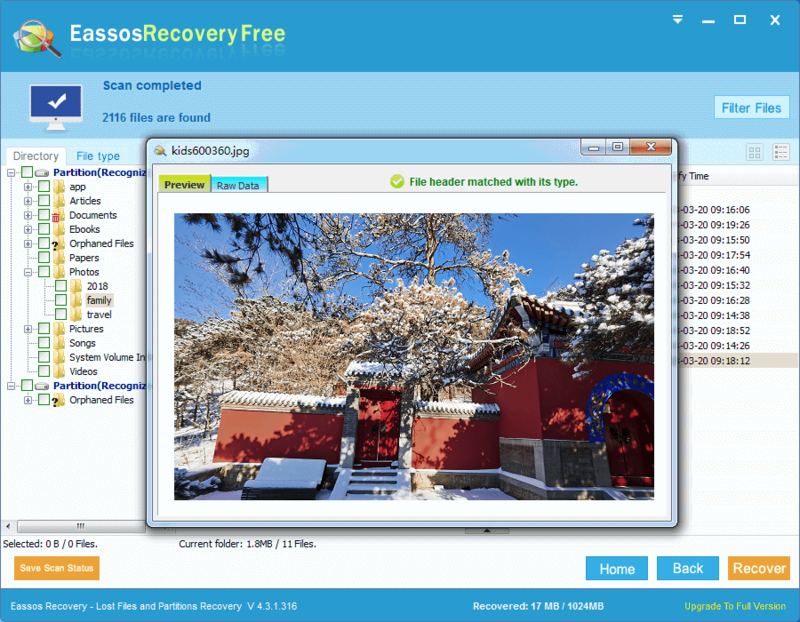 You can use free data recovery software and follow this guide to retrieve data from corrupted or malfunctioned USB drive. 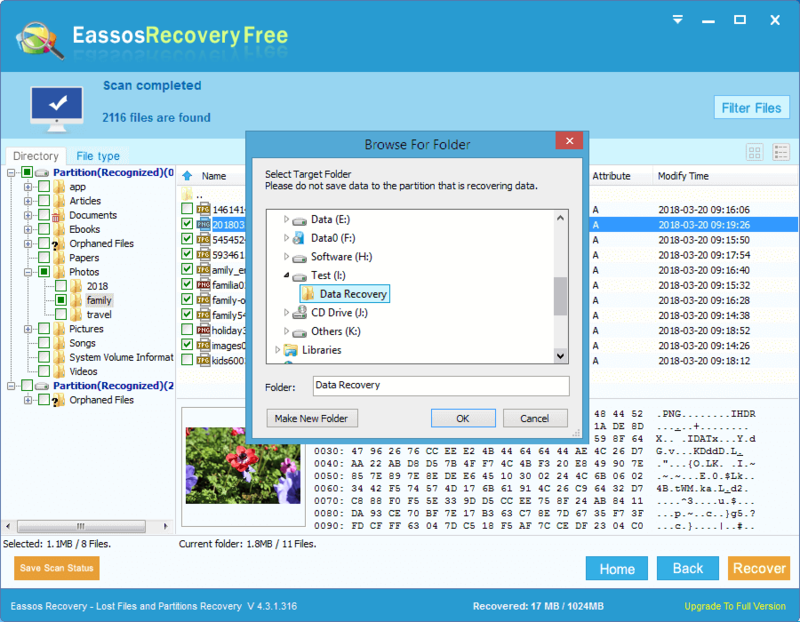 Step 1 Download and install Eassos free data recovery software to your computer and connect the corrupted USB device to your PC. 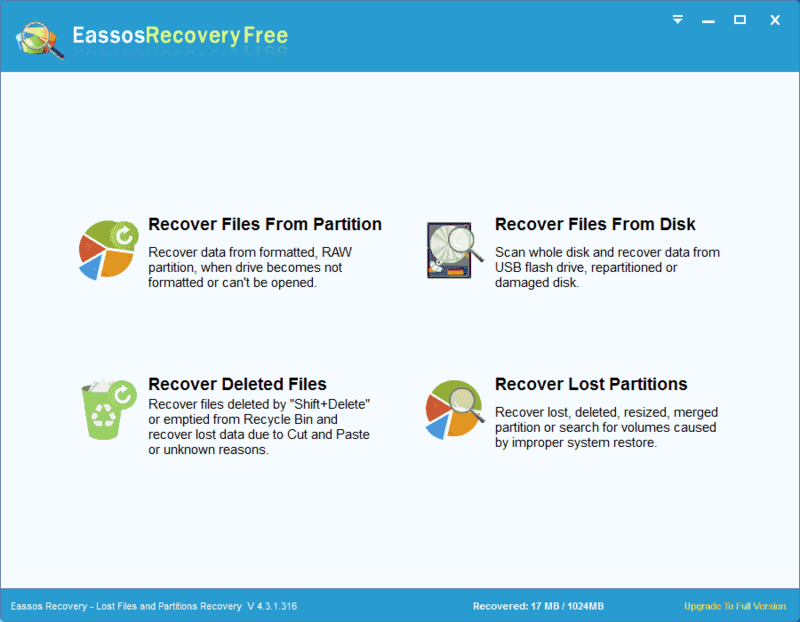 Step 2 Run Eassos Recovery Free and select "Recover Files From Disk" option. Step 3 Select the USB drive where you want to retrieve data and click Next button to let the software scan for lost data. The software performs a quick and deep scanning at the same time, and all recoverable files will be displayed when scanning completes. Step 4 Preview files from scanning result. You can double-click a file to open it in the previewing window which shows file content in its original size. 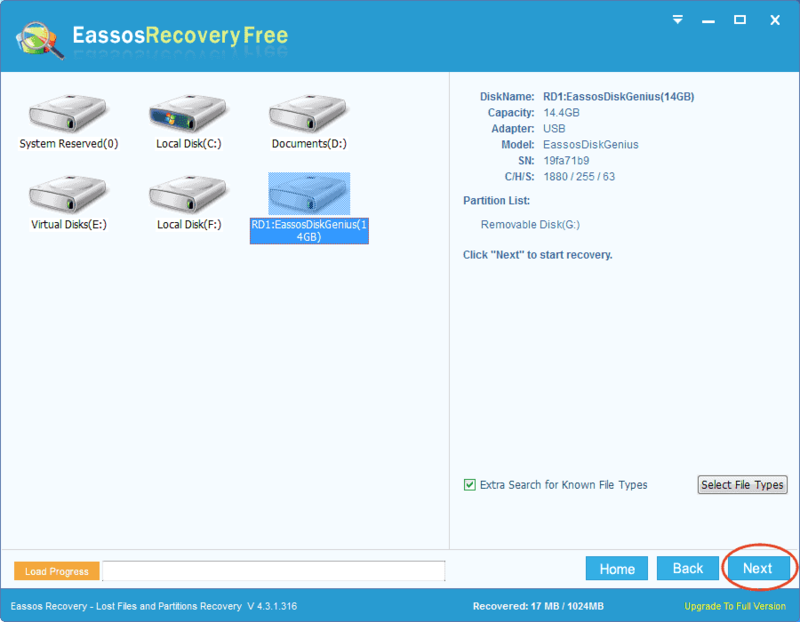 Step 5 Select files you want to restore and click Recover button. Then you can select a folder from computer to save recovered data. Once your files are recovered successfully, you can either format the problematic USB drive or send it to a repair center to get repaired. In this article we talked about several methods to fix USB not working issue, and most of these solutions have been tried and tested to workable by a number of users. If you follow these solutions one by one, then you should no longer face the USB not working problem. However, there is not guarantee that these methods work on all such issues, as different users have different configurations. If none of them works, the USB drive or USB port must have hardware issue, and you need to get them checked or repaired by professionals. Should you have any question on USB drive or SD card not showing up, not recognized or not working issue, please feel free to email our support team.